Here's this year's Valentine's Day bracelet. The cute beaded purse I found in Japan was the inspiration of the design. I bought a few extra mini-purses and other beaded charms from Japan and have them for sale on our website store (www.bfcraftclub.com) so you can buy it there along with the heart chain and heart box clasp. 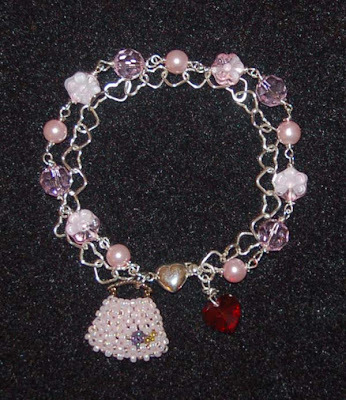 Of course you can make the bracelet using other decorative charms and beads. 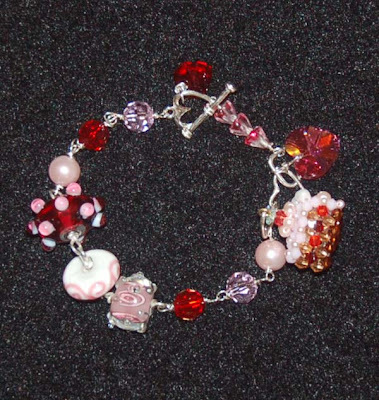 The instructions for this bracelet are with our other website Valentine projects. Pictured below are the Crystazzi crystals sold at Ben Franklin Crafts. These new crystals are by the Cousins company and are very similar to the Swarovski crystals but much lower in price. 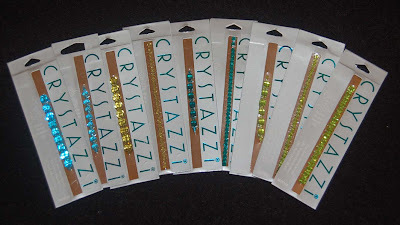 There are lots of colors and shapes of Crystazzi crystals available at BFC. While I was making the 'I love Shopping' bracelet I decided I wanted a new Valentine bracelet just for me. (See photo below.) I love sweets but I've been trying to cut back so I thought this 'I Love Cake' bracelet would be appropriate for my no-calorieValentine's Day jewelry. If you want to make this bracelet, we have the cake charm available on our site (but in limited quantities). I used other candy-like beads and did simple wire-wrapping on this bracelet. I hope that you will craft yourself or a loved one something sweet and sparkly (something good for your heart) for Feb. 14th, the day of love. Oh my, did I have a super-duper time shopping at Ben FranklinCrafts?!!! On Sunday, while looking in the Hilo Ben Franklin Crafts for prizes to giveaway in an upcoming blog contest, I saw signs up that said all red tag clearance items were an additional 50% off! Gosh, there were so many rubber stamp sets, beads, embellishments and other craft items marked with red tags. I was in shopping heaven. Also (maybe only at the Hilo store) the Hello Kitty Sizzix dies were 50% off. You have to check out the bargains before they're gone or the clearance sale ends. Don't forget craft club members get an additional 10% off the 50% off even on the clearance items. Boy, it's almost like getting the items for free! Pictured below are some new papers I purchased on an earlier shopping trip. 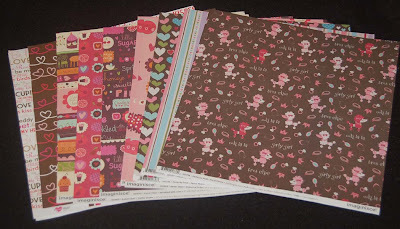 The printed 12x12 sheets are mostly Valentine ones from American Crafts and Imaginisce.....aren't they adorable? The solid papers from Core-dinations were new to me. They are textured and have different colored sides. 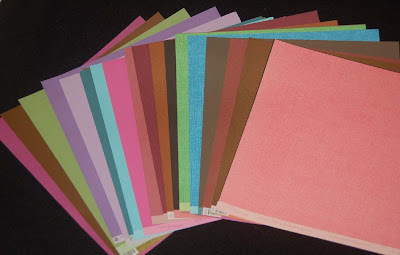 The color combinations are luscious and make the paper perfect for embossing and sanding to bring up the undercolor. Previously, I've only seen this type in packs, not single 12x12 sheets. Okay, that's it for today......go shopping at BFC.....don't miss out on some real money savers! It's so sad but I'm only now getting around to writing our family CHRISTMAS newsletter! I used to get it out before Christmas, then it became a New Year's Greeting and now it's evolved into a Valentine's Day card/newsletter. Oh well, better late than never. As you can see from the front example the card can lie flat for mailing and then folded upright(cards in the back) to display a greeting or photo (placed in the pocket). If you have a longer/secret message it can be put in the pocket too or written inside the card (side ribbons can be untied). For this card I used cardstock from the four-inch wide cardstock pack (Martha Stewart's Valentine collection) and other MS products. I will try to get this project on our website (http://www.bfcraftclub.com/) sometime next week. Thanks for reading my blog. I appreciate your interest and comments. Have a great crafting day! Okay, here's what I learned today. After you wipe off the tip of a glitter glue bottle or squirt a bit of glitter glue on a paper towel, throw that paper towel AWAY! If you leave it on your table you might use it to clean a rubber stamp and boy, that's a bad idea. Yup, of course you know how I learned this helpful tip today. Oh well, after scrubbing the stamp on a stamp cleaning pad several times it was pretty clean with just a few sparkly places. As promised, here are two cards (Click on the photo to see the details.) I made using the new Hero Arts Cling and wooden stamp sets. The birthday card is for my sister and although she is not a gaudy person; this card is very glitzy. I guess I just got carried away with all the sparkly Martha Stewart sprinkles. I love the bottles of tinsel glitter and microbeads in Valentine colors that come with a tiny tube of glue. The MS glue pen also works very well for glittering small spaces. My sister loves cupcakes so I thought I should put a giant one on her card. The birthday card used stamps from three different sets, which just seemed to go together. It was fun decorating the cupcake....less tasty than the real thing but not as messy. On the Valentine card the framed stamped words were a bit plain so I add some red glitter on the hearts instead of coloring the whole thing. Imaginisce has so many terrific Valentine papers that I kept changing my mind but finally settled on the heart one because it coordinated with my colored birds without over-powering them. Using the see-through Sizzix heart die made cutting simple because it didn't slide around and I could position it to save paper and cut exactly the part of the design that I wanted. Oh, another thing....see the wide red ribbon on the Valentine card?........that's the Christmas ribbon I bought from the Ben Franklin Crafts clearance aisle! Finally, pop-dots beneath the various paper pieces gives layered interest to the card design. Whew, maybe this is TMI and I should have just shown you the cards. LOL Thanks for stopping by and I hope some of this was interesting or helpful. Pictured here are some of the new rubber stamps from Hero Arts. 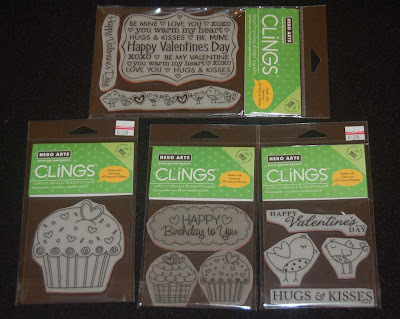 I have been pleasantly surpriesed with the Clings (green labels) rubberstamps because not only are they flat for easy storage but they work very well. I think the type of material (red rubber) in the Clings is superior to the material in the clear type of rubber stamps. I've had some problems with some of the thinner parts of clear stamps because they broke when I took the stamps off the acetate backing. However, the clear stamps have the advantage of making positioning of the design almost foolproof. Also the clear type of stamps tend to be less expensive than the other types. If you like to display your rubber stamp collection, then you'll want to invest in the wooden handled ones. 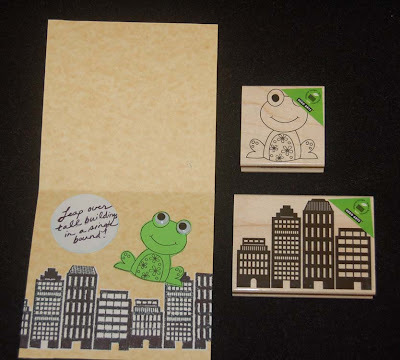 On a shelf, the wooden rubber stamps are decorative and easily accessible. In a future blog I will feature some of the projects I've made using the stamps photographed here. For me, rubber stamps are probably my favorite crafting tools because of their ability to replicate a design on a variety of surfaces. It's also a fantastic way to collect mini works of art created by some terrific graphic artists. If you've never rubber stamped, give it a try..... but be prepared to become a rubber stampaholic like me! When my husband photographed this card I bet he didn't guess it was for HIS birthday! Happy Birthday old man! I chose this paper because he was going to be traveling on his birthday. Actually the paper is a 12x12 that I think was from a kid's line of designs. 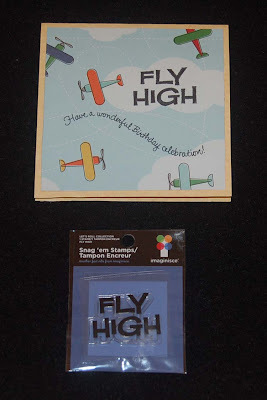 The Fly High stamp is an Imaginisce product and retails for only $1.49 at Ben Franklin Crafts. The curvy birthday word stamp is an old Stampendous one that may still be available. I like humorous cards so I went with the unexpected and paired the two new Hero Arts stamps and an adaptation on the Superman TV theme (inside the card). I guess you might have to be an over-the-hill person to get the humor.....so you got it right? Also the idea of a superfrog is a joke between my husband and me. We don't know whether my husband is not a prince so my kisses don't work or I'm not a princess. Oh well, all that matters is that I think he's a prince and he treats me like a princess. LOL! This second card is a get-well one for a sick friend who recovered before I even got it in the mail. Anyway, the good intentions were there. I used the Hero Arts stamps and the paper came from a K and Co. printed paper pack. I really like the sentiments in the HA stamp set because they are already in quote or thought bubbles. 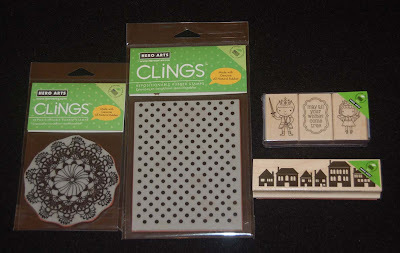 Check out all the new craft items appearing in Ben Franklin Crafts for 2010. Don't forget to check out the clearance bins too. I got a deal on a giant-size wide roll of red velveteen Xmas ribbon....90% off....perfect for Valentine's Day cards and gifts. The plastic backed ribbon can be punched with the not-too-intricate paper punches. Also in the sale section were rub-on Valentine decals and colorful heart rhinestones. It really pays to look everywhere in Ben Franklin Crafts and to imagine what can be made from the bargain clearance items. 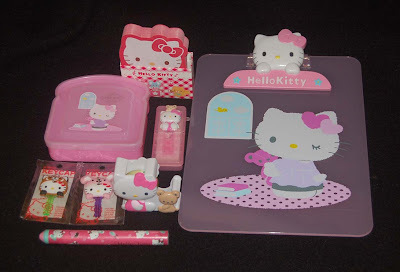 I know that many of you are Hello Kitty fans....big time....like me. Recently on a shopping trip to Ben Franklin Crafts, I saw the cute items in this photo. The clip board is my favorite and I plan to hang it in my craft room and use it to fasten the magazine clippings and projects printed out from websites. The sandwich holder is a unique item I decided to give to someone who packs lunch to work. The two items you might not recognize are key covers, which I think will be a great and cute way to identify my keys that sometimes get mixed up. The rest of the stuff are not unusual (tape dispenser, eraser, note pad, and band-aid holder) but they will make terrific Valentine gifts to tuck into treat holders. Okay, now go check out the Hello Kitty section in BFC to find something cute you just gotta have. This is a photo of my first Valentine project using some of the supplies I recently purchased. It's really easy to make because the individual bags are Sizzix die cuts. 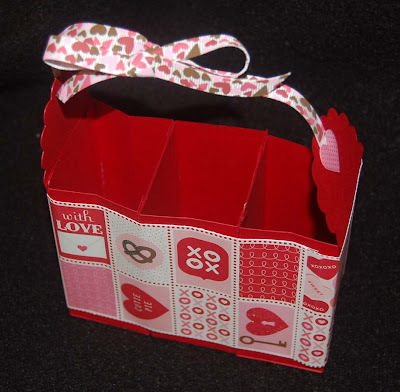 The instructions for the three part box is on our website (www.bfcraftclub.com). I needed a three part box because I have three handmade bars of soap that I am giving as a gift. (See next photo.) 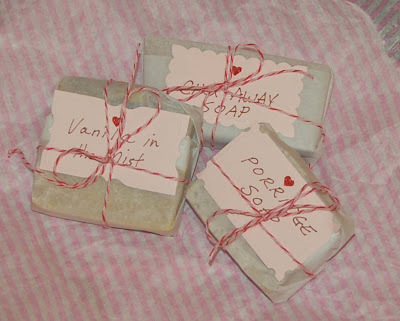 To make the soaps seem more special and to keep them from oil staining the box, I wrapped each bar in parchment paper, adhered a MS Valentine label, and tied each bundle with MS twine. A little tissue paper tucked around the soaps adds a festive touch to the presentation. Of course, you can put edible treats in the compartments or tuck in craft supples. By putting two of the bags back to back a two part box can be constructed. 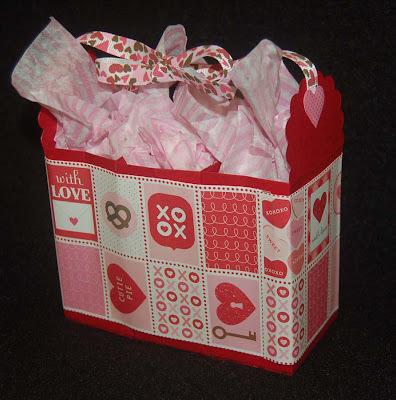 However you decide to present your Valentine surprises, now is the time to head to Ben Franklin Crafts and get your supplies of paper, punches, and embellishments. See you there! If you haven't been to Ben Franklin Crafts recently, you must go and check out the Valentine supplies, especially the Martha Stewart line. The line of MS Valentine punches are really fabulous and they cut wonderfully. 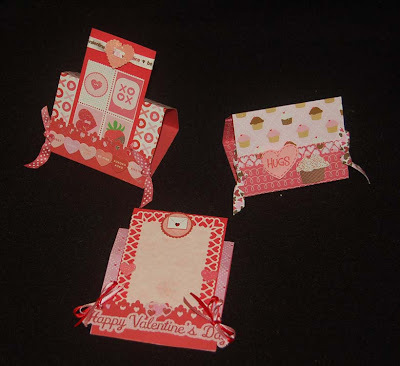 I also love the MS 12x12 Valentine paper pack as well as the smaller paper pack that has a slightly different assortment. Being a rubber stamp addict, I had to buy the MS Valentine rubber stamp set, which has the cutest images and includes three ink pads. Also just for Valentine's Day, the Martha Stewart line has a set of pink, red, and silver tinsel glitter. This glitter is composed of sparkly slivers so the look is very different from regular glitter. 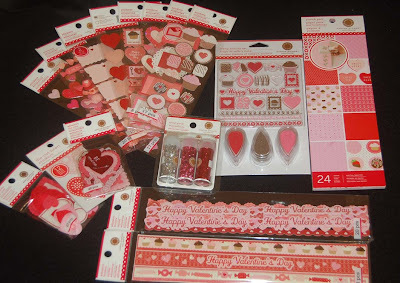 Of course, the Martha Stewart Valentine line has lots of fancy embellishments, including adhesive borders and stickers. Now is the time to shop for your Valentine craft supplies before all the good stuff disappears off the Ben Franklin Craft shelves. 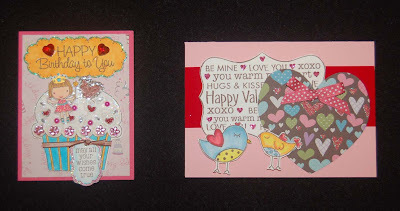 In the coming weeks on this blog, I will be featuring projects using the sweet Valentine products I have discovered, so come back often to get some ideas and leave a comment. I love hearing feedback and learning about what you are crafting. Most people think that garnets are always red, a deep blood red. But January's birthstone can also be found in a pretty pink, a peridot-like green, or even shades of brown called hessonite garnet. Pictured here (click on photo for a close-up view) are two bracelets with garnets that I made to celebrate the start of a new year. 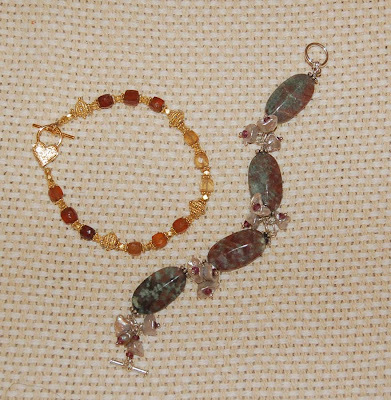 The one with the oval green jasper beads feature heishi pearls with pink garnet centers. The other bracelet with gold filled findings contains hessonite garnets in gradiations of chocolate brown to champagne. Whether you are a January baby or not, garnets are an elegant, not-too-pricey, colorful, semi-precious gemstone that you should include in your jewelry creations to make them sparkle all year long. Happy Happy Happy New Year 2010! 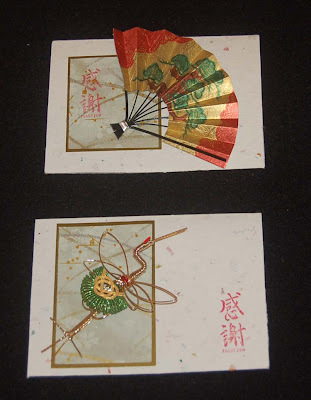 When I saw the mini Japanese fan and woven crane at Ben Franklin Crafts, I purchased them because they were beautiful and I knew that I would find a use for them in the future. I left them on my desk for inspiration and yesterday I decided that they would be a nice focal point for some of my thank you cards. I used a gold card stock and some decorative (12x12) washi paper from BFC as the base onto which I wired the fan and crane. I used the thin wire that I removed from the wide wired Christmas ribbons.....recycle, recycle, recycle. The Japanese character stamp I purchased decades ago but I'm sure you can locate a similar one. The card blank is a rough handmade paper so I lightly glued some smoother paper inside the card for a better writing surface. I'm not sure what the crane and fan (there was a turtle too) were supposed to be used for (maybe gift wrapping decoration) but I am suggesting to the people I am thanking that they remove the fan or crane and use them for Christmas tree ornaments next year. Also if you lightly tack in the thank you note paper it can be removed and the card can be reused.....recycle, recycle, recycle. Keep crafting in 2010 and keep the world green by recycling.